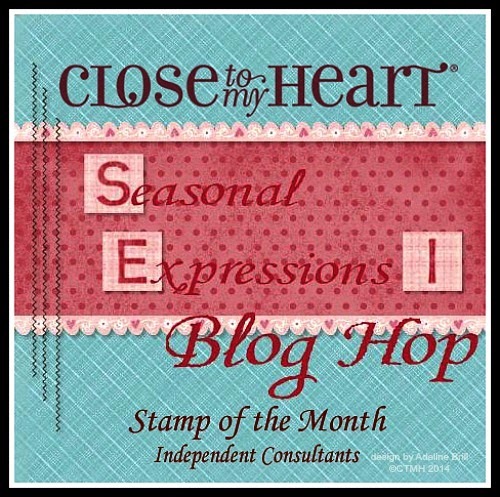 Welcome to our Seasonal Expressions Blog Hop! Today we have almost 40 CTMH Consultants featuring new products from our very first Seasonal Expressions Holiday Mini Catalog! If you've come here from Krista's Blog you are on the right track! If you get lost along the way the complete listing of hop participants can be found by clicking HERE. Since we are just 19 days away from Christmas I thought a gift item would be perfect for today's hop! I've finally finished getting all my projects ready for the big Si View Holiday Bazaar on Saturday including these adorable Sock Cupcakes. This one features our new Hopscotch paper pack and cuts from our Artiste and Art Philosophy cartridges. This paper is full of bright fun colors and patterns - perfect for spring time and Easter projects. You can order from the fabulous Seasonal Expressions mini starting on December 1st through March 31st 2015. Be aware that all the papers and kits can ONLY be ordered during those months - once this Seasonal Expression is over anything with the little clock symbol next to it will no longer be available! To see the new booklet online CLICK HERE and it will take you to my online site to view it or download the PDF! Now hop on over to Pam's Blog and see what she has created with our fun new seasonal items! Yes! Love the different "look" for Hopscotch and the li'l stocking is cute! Cute creation. I was surprised to see Hopscotch used for Christmas, but it works so well. That is a *darling* stocking! Very creative Paige! I never thought of using Hopscotch for Christmas but it's perfect! You are so clever! Love the sock cupcakes!